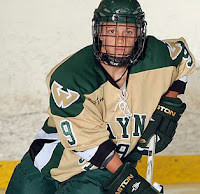 The Wayne State Warriors stumbled again on Saturday afternoon losing, 2-1, to Niagara Purple Eagles at the Dwyer Arena. After two scoreless periods Veronique Laramee-Paquette scored on a power-play deflection at 12:52 of the third to give the Green and Gold a 1-0 lead. The edge lasted only about a two and half minutes though as Niagara freshman sniper Jenna Hendrikx beat Delayne Brian to knot up the score. Despite WSU outshouting NU 13-5 in the final twenty minutes the two teams skated off after regulation with a 1-1 tie. Frances McPhail and the Purple Eagles handed the Warriors their first loss in five overtime games this season when she buried a rebound at 3:06 of the extra frame. The win was Niagara’s first in the last eleven games vs. Wayne State. Brian finished the night with 15 saves for the Warriors. Jenni Bauer recorded 18 stops for NU. Wayne State made no mistake on Sunday as they rolled to a 3-1 victory over Niagara. Jill Szandzik, Gina Buquet (pictured), and Alyssa Baldin all scored before the midway mark of the second period to post the Warriors to a 3-0 lead. Jennifer MacLean got the Purps on the board with their lone goal at 19:59 of the second period, but that was the only shot that squeaked past WSU’s Lindsey Park. Park stopped 22 shots, including 10 in the final period, to record her second win of the season. Jenni Bauer trapped 12 shots for Niagara. Laramee-Paquette recorded two assists on the day and Julie Ingratta had another helper to extend their points streaks to five games. WSU now leads the all-time series vs. NU 18-17-0. With the split, Wayne State now sits at 5-8-3 overall and 2-4-0 in the CHA, good for fourth place. Wayne State will not return to action until January 8-9 when they host the Vermont Catamounts in a pair of non-conference games at the City Sports Center in Detroit. Photo courtesy of WSU Athletics.